Twist the barrel until the brush tip is filled with face paint. Can I refill the products? Snazaroo Brush Pens aren’t refillable. However, we’ve packed in as much paint as we can for hours of painting in each pen. You can easily remove Snazaroo Brush Pen paint from skin with a little soap and warm water. Don’t forget to also clean the brush and nib in water to make sure they’re ready for your next masterpiece. There are 12 brilliant colours in the Snazaroo Brush Pen range that give you the perfect palette to create everything from Halloween monsters to robots, tigers, fairies and more. The only limit is your imagination. Can it be used by people with sensitive skin? Snazaroo Brush Pens are suitable for sensitive skin and are fragrance free. How many colours come in the pack? There are three colours in each themed colour pack. The Adventure Brush Pen Pack contains one red, one gold and one blue Brush Pen. What packs do we currently offer? 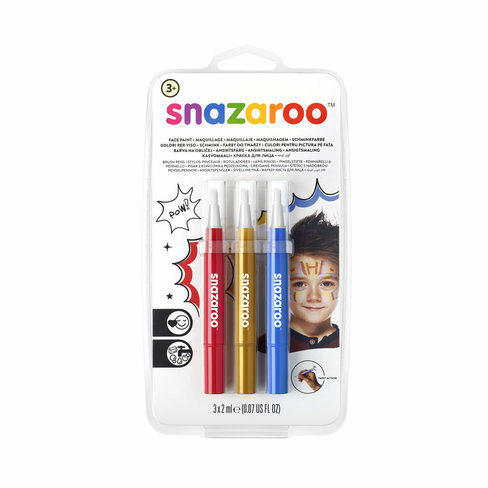 Snazaroo Brush Pens are available in five themed packs: Monochrome (black and white), Adventure (red, gold and blue), Halloween (black, white and orange), Fantasy (purple, pink and silver) and Jungle (yellow, green and brown). Safety Information: Store in a cool and dry place with the cap on. Do not apply on broken or inflamed skin. 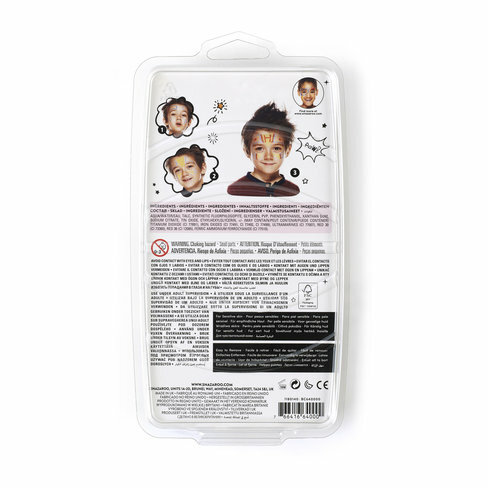 A patch test is recommended: apply to inner elbow; if an allergic reaction occurs within 1 hour, do not use. For external use only. Keep away from sunlight. Some colours may stain. Retain instructions.